Paul Theroux’s best-selling Dark Star Safari chronicled his epic overland voyage from Cairo to Cape Town, providing an insider’s look at modern Africa. Now, with The Last Train to Zona Verde, he returns to discover how both he and Africa have changed in the ensuing years. Traveling alone, Theroux sets out from Cape Town, going north through South Africa, Namibia, then into Angola, encountering a world increasingly removed from tourists’ itineraries and the hopes of postcolonial independence movements. 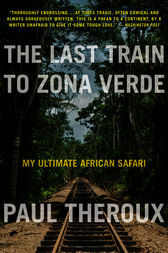 After covering nearly 2,500 arduous miles, he cuts short his journey, a decision he chronicles with unsparing honesty in a chapter titled “What Am I Doing Here?” Vivid, witty, and beautifully evocative, The Last Train to Zona Verde is a fitting final African adventure from the writer whose gimlet eye and effortless prose have brought the world to generations of readers. PAUL THEROUX’s renowned travel books include Ghost Train to the Eastern Star, Dark Star Safari, and The Great Railway Bazaar. His acclaimed novels include The Mosquito Coast, Hotel Honolulu, and The Lower River.